Nearly every business enterprise involves office computers, and usually they are connected to a local network. In order to systematize the configuration and accounting of computer hardware and software, it’s necessary to periodically take their inventory. This includes conducting SAM, the process of streamlining the management of the company’s software assets. In every company, physical assets on the local network are equipped with special software, usually licensed. And licenses, especially for specialized software packages, often cost a lot. This means that even if such a software package is installed on just one “extra” PC, it can be quite an expensive oversight. SAM methodology is used precisely in order to control what exactly this kind of software is used for and to make sure that the license renewals are done on time. So, what are the main tasks of SAM? • accounting of funds allocated for the acquisition of software. In this article, we’ll discuss conducting SAM using Total Network Inventory (TNI). There are two methods of conducting SAM: manual and automated. The former method of software audit is used when the total number of computers on the local network does not exceed a few dozen units. If there are more PCs, and therefore more licenses, then an automated solution such as TNI would be better suited for the task. Below we’ll describe how to manage your software assets with the help of our product. The centralized TNI storage contains detailed information about each local network node. With TNI 3, system administrators can add various data fields for each PC, assign inventory numbers, as well as view, change and supplement license information for installed software. In addition, TNI automatically gathers basic information such as MAC and IP addresses, current OS, network state (online/offline), accessible admin shares, etc. All these key parameters allow you to quickly navigate hundreds of computers, eliminating the possibility of long downtimes. TNI 3 can scan various OSes, among them Microsoft Windows XP and up, including server versions, OS X, Linux, FreeBSD and ESX/ESXi hypervisors. To begin the process of scanning network nodes, you will only need access to an account with administrator rights (i.e. domain administrator, if the computer is part of the domain). You won’t need to perform additional procedures on remote PCs (like installing local agents). It’s enough to allow intermediate local firewalls to pass traffic via the SMB or RPC protocol from Total Network Inventory. Also, you can create your own schedule to make scans regular and automatic. Such a solution will help avoid the expiration of software licenses and facilitate the timely inventory of recently installed software tools. The software audit process is simple. After the network computers are successfully scanned, TNI will analyze the software and license keys found on them, and as a result, a list of all discovered programs will appear on the Software accounting tab. Once you select one or more programs in the list, the details panel will show which computers they are installed on and the installation date. Auditing PC software is an important part of SAM. You can configure which computers must have certain software, and on which it should not be installed by going into the Tracking mode. As soon as you set a specific policy, computers that violate it will be highlighted directly in the details panel, and you’ll also be able to monitor the number of violations for each software from the main list. You can also see a list of computers that violate the tracking policy for at least one program by filtering the network tree using the “Tracked software” assistant. If you own a TNI Professional license, then you have access to software license audit functions. License management is available for each program detected during scanning. When creating a license, you can specify its cost and dates of acquisition and expiration. Different license types are supported, including standard licenses with a limited number of installations, unlimited licenses, and even unwanted pirate licenses. You can read about various licenses that you can create in TNI here. You can monitor the license status from the list of licenses. You’ll be able to see which software has insufficient licensed copies, and which has extra, and also whether the license has expired. Let’s sum it up. 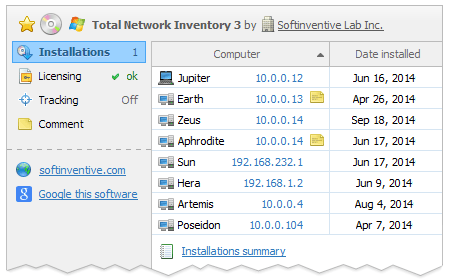 Total Network Inventory 3 is a special application that simplifies the management of network devices and licensed software within your company. Thanks to this solution, the administrator responsible for the network can easily keep track of hundreds of nodes, providing timely software updates, making it possible to accurately count the number of available licenses, and removing the possibility of illegal use of individual software products.